Like the forever under appreciated underground icons Golem, Cemetery, Ingurgitating Oblivion and Pavor, Anasarca was never one of the big German death metal bands. It probably didn’t help either that they completely fell off the map after 2004’s uniformly savage “Dying”. To say that their resurgence in 2015 was unexpected would be an understatement. They never formally split as much as they went on an extended hiatus as members tended to other obligations. "Survival Mode” - a conceptual undertaking about the extremes that humans will resort to in life-threatening situations – is therefore fitting on several levels, the most obvious that Anasarca absolutely refuses to go quietly into the night. They’re the ultimate survivalists. The near-decade long hiatus hasn't dulled Anasarca in the slightest. Anasarca was, is and forever will be, Michael Dormann and his rotating assembly of musicians. “Survival Mode” is a new chapter of sorts. It’s the first without long-time drummer Herbert Grimm as well as the first since 2000’s “Moribund” to be written and recorded as an entire band and, in a first since their sub-classic debut “Godmachine” from 1998, all the lyrics were written by the band themselves. 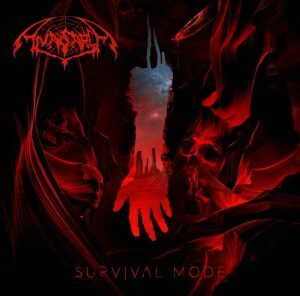 As expected from a band returning after an extended hiatus “Survival Mode”” is sounds instantly familiar, as if Anasarca (who have the coolest logo ever) never disappeared into anonimity after “Dying”. Not everything on “Survival Mode” is new. ‘The Weird Ways’ and ‘Scorn’ are regular bonus tracks, whereas the Obituary cover ‘Godly Beings’, previously unreleased track ‘Paralyzed’ and the re-recording of ‘Dogmas Ignored’ from the pre-Anasarca outfit Vomiting Corpses were pulled from the “Dying” sessions in 2004. The most obvious question, of course, is - how does Anasarca sound after such a long hiatus? Pretty much the way they’ve always sounded: American brutality (in the vein of Hate Eternal circa “Conquering the Throne”) coupled with a Swedish sense of melody that’s closer to Dismember than it is to any of the classic Gothenburg bands. Anasarca is very much death metal in the traditional sense. “Survival Mode” does not waste time with ornamental niceties and cosmetic trivialities nor does it concern itself with modernities on any front. For the most part it looks and sounds just the way you’d want Anasarca to sound in this day and age. Cementing further links to the band’s past is the artwork from Robert Sindermann and the band have kept their association with producer/engineer Cord Hanken and his Art Temple Studio. Anasarca plays death metal, pure and simple. “Survival Mode” is refreshingly without pretense and without any of ailments of more contemporary releases. Is there still a place for Anasarca in a scene that has scene grown exponentially with the likes of Defeated Sanity, Despondency, Necrophagist and Obscura? Anasarca comes from an older generation of death metal when the likes of Blood, Fleshcrawl, Protector, and Purgatory reigned supreme. “Survival Mode” is not about to rewrite the book on traditional death metal nor does it pretend to. Anasarca has always been more feeling than about technical mastery and showmanship. As such “Survival Mode” is a rousing success. It succeeds in what it sets out to do and frequently surpasses expectations. Nobody had imagined that Anasarca would ever awaken from their hiatus anyway. “Survival Mode” is testament to Dormann’s will to survive no matter what the circumstances. Lesser bands would’ve thrown in the towel years ago, but not Dormann. Like the events he describes in his lyrics, Anasarca thrives on trial and tribulation. One can only wonder what the future will bring for this long-suffering German act. Hopefully more music.